Take to the skies for only £39! The mini buzz is the ultimate way to take to the air and see the stunning English Coastline from the Air. Departing Shoreham you are guaranteed to see Lancing College and the stunning Shoreham coastline from the best seat in the house! 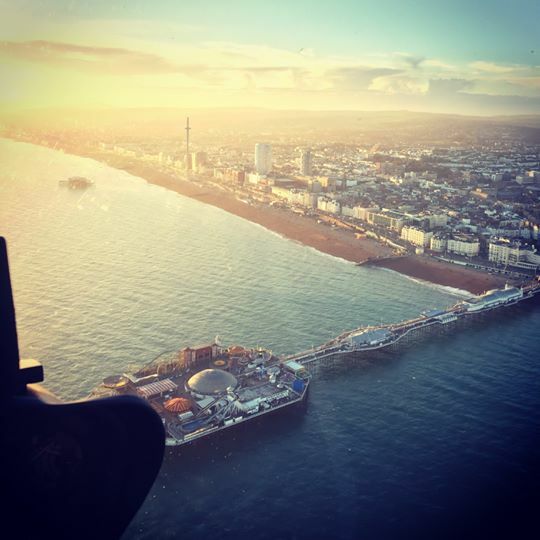 The brighton buzz is the ultimate way to see Brighton from the air. Departing Shoreham you will follow the coast into the centre of the bustling city. Seeing Shoreham, Hove, Hove Greyhound track, Sussex cricket ground, The wreckage of the old pier, The I360 and the Palace Pier and the Marina. You then head north to fly over the Amex - Home of Brighton and Hove Albion Football Club. The aircraft then turns towards Shoreham following the stunning South Downs before reaching Brighton City Airport - The UK's oldest municipal airport. Departing Brighton City Airport, you will fly towards the bright lights of the big smoke. Passing over Gatwick Airport, you will see the stunning scenery of the English Countryside before being dazzled by the Capital City of London. Once over the City, the Helicopter will travel down the Thames so that you can see all of the famous landmarks (Battersea Power Station, Buckingham Palace, The Houses of Parliament, Big Ben, The Shard, Canary Wharf, The Globe Theatre and so much more). After leaving London, the Helicopter will travel towards Kent, passing over Brands Hatch Motor Racing Circuit and some of the most prestigious houses in the South East. From the stunning scenery of the Garden of England the Helicopter will then pickup the coast at Beachy Head. From here, the Helicopter travels west tracking the best sights on the south coast. Seaford, Newhaven, Brighton Marina, Brighton City, the Pier, the I 360 all of which you will see from the luxury and comfort of our Airbus AS350 Helicopter, which is undoubtedly the coolest helicopter in the world.